When you are injured by someone’s negligence, numerous legal questions come to mind. You may feel concern about the process of pursuing a claim for compensation or the financial costs of your mounting medical treatment. 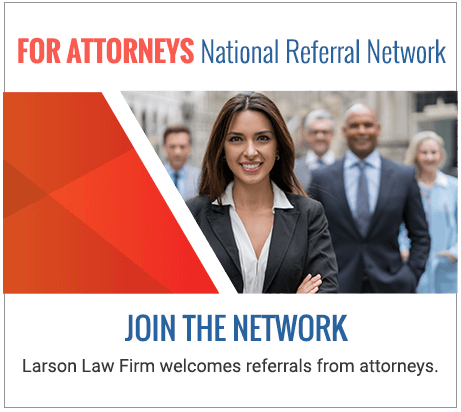 At Larson Law Firm P.C., our highly skilled North Dakota personal injury lawyers want to make sure you have the answers you need to make thoughtful decisions regarding your personal injury case. The following are responses to some of the most common questions we receive from personal injury victims. In actuality, what the court awards you may be lower than the amount we propose. These numerous variables make it extremely difficult to provide a concrete answer on the monetary value of your case. What we can give you is a promise to vigorously fight for the best settlement we can get. We won’t take your case if we feel that we can’t get more compensation for you than what the insurance company would offer on its own. How much do I have to pay my personal injury lawyer? At Larson Law Firm, we do not collect a fee unless we win a settlement or verdict for you. Our fee is based on a percentage of the amount we win for you above any offers you previously received. You do not have to worry about the upfront cost of legal fees. They will be deducted from your personal injury award. This is also a question where the accurate answer depends on the specific details of your case. Some personal injury cases are open and shut, where the evidence clearly demonstrates that negligence caused the resulting injuries. Under these circumstances, an award may be obtained more quickly. Many personal injury cases require more thorough investigation by experienced North Dakota personal injury attorneys. We work with a team of experts and witnesses to present the right evidence to prove your case. When you secure our legal services, we review all aspects of your case and let you know what you can expect in terms of the timeline. Depending on the level of complexity, your case could take weeks or months. Can I still win a settlement if I was partially at fault in the accident? The state of North Dakota recognizes the modified comparative fault rule. This means that if you are found to be 50% at fault for the accident, you cannot recover any compensation. However, if you are found to be 49% or less at fault, you can still recover damages. Our attorneys work to minimize any fault you may have contributed to your accident and show that the greater fault lies with the defendant in your case. In many cases, our attorneys can negotiate a settlement on your behalf without ever having to go to court. We understand how stressful and intimidating court can be for our clients. That is why we earnestly attempt to work with the insurance company or other responsible party directly to settle the case quickly. Many companies will agree to settle the case so that it doesn’t have to go to court and potentially cost them much more in legal fees. Companies will also try to avoid court since it may result in a larger settlement. Yet, even with our best settlement efforts, some cases do require court appearances. Our knowledgeable lawyers work with you to ensure your understanding of the courtroom processes. We are skilled litigators, and we do not back down when our clients need us the most. What if I’ve already received a settlement offer from the insurance company? Do not move forward with accepting that offer until you have spoken with one of our personal injury attorneys. Insurance companies routinely offer settlements that are significantly smaller than what they would likely be ordered to pay by a court. Don’t be fooled by their tactics. By working with one of our attorneys, you get a tough legal advocate who will work to maximize the financial compensation you receive. The lawyers of Larson Law Firm P.C. have years of knowledge and experience with various types of North Dakota personal injuries cases. If you have further questions about the personal injury claim process, trust us to provide you with honest answers. Complete our contact form or call us toll free at 701-484-HURT to schedule a free initial consultation. From our office in Minot, we are proud to represent clients throughout Ward, Williams, McKenzie, Pierce and Mountrail Counties.